Easily grown in average, dry to medium, well-drained soil in full sun. Tolerates some light shade. Prefers dry, stony soils. Tolerates a wide range of soil conditions, including poor soils, but must have good drainage. Dislikes shade and wet soils. Plants have fibrous roots with a deep taproot. Plants remain in the landscape by self-seeding. An individual plant can produce as many as 180,000 seeds in its second year. Basal leaves are evergreen in warm winter climates, but sometimes retain significant green color under snow cover in colder winters. Verbascum thapsus, commonly called common mullein, is a wooly biennial herb that produces (a) a basal rosette of stalked, thick, soft, densely-hairy, flannel-textured, pale gray-green leaves (to 6-15” long) leaves in the first year, (b) an erect, solitary, unbranched, densely hairy flowering stem rising from the center of the rosette to 7’ tall in the second year, each stem being topped in summer by a 20-inch long cylindrical inflorescence of densely-packed, 5-lobed, saucer-shaped, sulphur-yellow flowers (each to 1” across); flowering stems appear winged because the smaller fuzzy alternate oval stem leaves have tapered and prolonged bases which extend down the surface of the stem, (c) a long June-September bloom of flowers, a few at a time, with the best bloom usually appearing in July, (d) rounded downy seed capsules (1/4” diameter) which mature in fall followed by death of the plant as the seed ripens and the bicentennial life cycle is completed. This weedy plant is native to Eurasia. It was first brought to the U. S. in early colonial times primarily because of its extensive history as an herbal remedy for a large number of medicinal impairments. It has now spread and naturalized in all 50 states and across Southern Canada. It is often found in disturbed areas including roadsides, old fields, pastures, railroad right-of-ways, vacant lots and waste places. It is listed as a noxious weed in the states of Colorado and Hawaii. Tea made from the flowers reportedly has a soothing, sedative effect. Leaves and flowers have been used medicinally for treatment of a wide variety of impairments including lung diseases, sinus problems, coughs, colds, sore throat, asthma, emphysema, colic, diarrhea, migraines, earaches and inflammation reduction. The leaves contain rotenone (insecticide) and coumarin (prevents blood clotting). Genus name may come from the Latin word barbascum which means bearded plant. Specific epithet honors the ancient village of Thapsus (now in ruins) located near Carthage in modern day Tunisia. 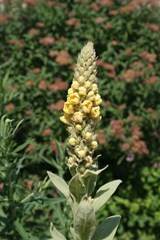 Common name of mullein comes from the Latin word mollis which means soft in reference to the flannel-textured leaves. No serious insect or disease problems. Susceptible to spider mites in hot conditions. Watch for weevils and slugs. Plants grown in rich, fertile soils grow taller and may need staking or other support. Wet, poorly drained soils are usually fatal. Borders and cottage gardens. Herb gardens. Good vertical accent. Grows well in poor soils and will grow well on dry, rocky slopes or scree.